I love me a good nonfiction picture book. Here are a few gems I've come across recently. 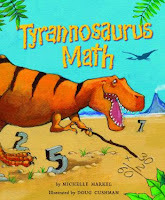 Tyra nnosaurus Math by Michelle Markel, illustrated by Doug Cushman. Tricycle Press, July 2009. Review copy provided by publisher. The first thing he did out of the egg was add up his fingers and toes, so his mom named him Tyrannosaurus Math. From then on, T-Math was doing math constantly, from addition and subtraction to multiplication, estimation, and geometry. This lively story will add to any math unit and the bright acrylic illustrations demand to be pored over. A section in the back of the book explains the various mathematical skills that T-Math demonstrates. Young dinosaur fanatics who are learning these concepts will thrill at seeing T-Math use them in the story. 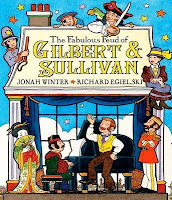 The Fabulous Feud of Gilbert & Sullivan by Jonah Winter, illustrated by Richard Egielski. Arthur A. Levine Books, April 2009. Copy from my local library. This book tells the story of Gilbert & Sullivan's big argument and how the friends made up with each other and went on to write one of the most famous operas, The Mikado. Bright, detailed illustrations bring the time period to life. The text is simple enough to read aloud and an author's note gives great background information about both men and their work together. I love picture book biographies and this did not disappoint! World in Colors series, published by Capstone Press. 2009. Copies from my local library. As someone who used to fill preschool loan requests, these books would have come in handy. There's not a lot of preschool-appropriate country books being published and these fit the bill nicely. Stunning, colorful photographs appear on each page with a short paragraph of information that ties a color in the photo into something about the country. For example: "A Kenyan farmer walks through a sea of green tea leaves. Tea pickers toss the leaves into large baskets. The tea is prepared in a factory. Kenya is one of the world's top tea growers." (pg 5) The text is simple enough to appeal to beginning readers and the books could easily be read with preschoolers (paraphrasing where necessary) or you could just use the books for their fabulous photos. These books could also add a multicultural element to your units on colors. I feel like I've been absent from Nonfiction Monday for far too long, so I'm happy to be joining you again this week! Visit Wrapped in Foil for this week's round-up. 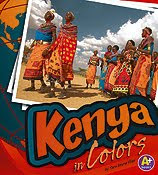 I was wondering what Kenya in Colors was like. I could see someone going on a trip with small children valuing a preschool-friendly country book. So you are going to do NaNoWriMo? Hope you have fun! Roberta, I am going to do NaNoWriMo this year! I may be crazy, but I'm very excited!